Plant resistance to harmful microorganisms (pathogens) is largely determined by a set of enzymes encoded in DNA, which are involved in death of infected cells and prevent infection spreading. Such enzymes that provide protein breakdown are called proteases. Despite the importance of wheat in agriculture and science, including biotechnology, reaction of these plants to pathogens is described only in general (for example, in these two papers), without focusing on specific proteins. The complexity of study refers to the fact that wheat, like most other plants, is polyploid. It means that each cell has several sets of chromosomes. 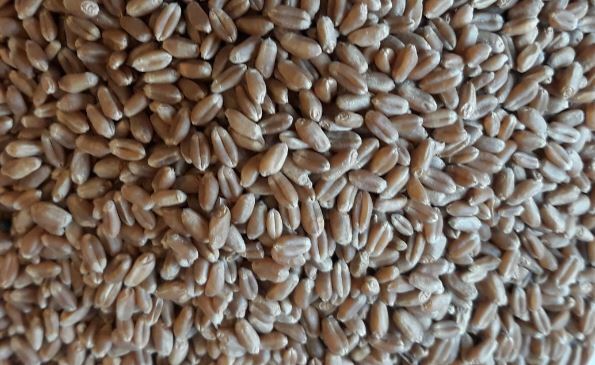 In the case of wheat, it is attributed to the fact that Tríticum aestívum (wheat species used in agriculture) were cultivated by crossbreeding of Triticum Urartu, Aegilops tauschii and related species. As a result, wheat genome is complex and contains 107 thousand genes that is almost five times more than a human genome. Wheat is exposed to various pathogens (bacteria, viruses, fungi), nematodes (roundworms) and insects. Some of them parasitize on living plant cells, slowing their growth (biotrophic pathogens), others feed on cell content that leads to its death (necrotrophic pathogens). The scientists used two pathogens: biotrophic pathogen (Puccinia recondita), that causes wheat leaf rust, and necrotrophic pathogen (Stagonospora nodorum) that damages leaves, heads and grains. The biologists studied ‘Khakasskaya’ and ‘Daria’ wheat cultivars to find out the impact of fungi infectionon plants. They used specific method that combines liquid chromatography and mass spectroscopy. Liquid chromatography is a technique used to identify mixture of substances passing in a liquid flow through a tube filled with sorbent. Due to the fact that substances are absorbed in varying degrees, the mixture is divided into components. Mass spectroscopy is a technique that ionizes neutral atoms and molecules into charged ions based on their mass-to-charge ratio. It makes possible to accurately determine even complex organic compounds. In total, the scientists discovered 1,544 enzymes that belong to five catalytic types of proteases: serine, cysteine, aspartic, threonine and metalloproteases. They determined that protease proportion common in different plant cultivars is lower than expected (about 60% vs. 79.3%). However, the differences (about 40%) are divided almost equally between several types of proteases, indicating that these enzymes are likely to substitute each other. The study of proteases helped to predict specific sites in their structures. The process of hydrolysis in such regions may be activated in the course of proteolytic cascades. This chain reaction allows an organism to activate many enzymes quickly that help it to fight infection. “We have discovered above all that activation of proteases found in infected plants does not involve enzymes with caspase-like or metacaspase-like activities. Although earlier it was assumed that such proteases initiate proteolytic cascade activation, that leads to cell death of the plant organism. We concluded that some other unique proteases might be involved in wheat early response to infection with both biotrophic and necrotrophic pathogens. Surely, this result should be confirmed experimentally using alternative methods,” told Prof. Andrey Zamyatnin, Director of the Institute of Molecular Medicine (Sechenov University), co-author of the article. The detailed study of enzymes allowed to clarify their classification. The scientists have described homologs (the most similar proteins) for enzymes of several groups, and clarified position of these enzymes in a phylogenetic tree (it shows evolutionary distances between proteins). For example, scientists have determined that aspartate proteases that belong to different types differ to such an extent that they may not be related, but have acquired similar functions independently. The study also helped to clarify ideas about specific mechanisms for triggering cell death in plants. It is known that one of the main apoptosis regulators in animals are caspases – proteolytic enzymes that initiate destruction of the cells into separate elements. Some animal caspases introduce cleavages in others, and thereby send a signal that it is time to start cell death. “The discovery of programmed cell death commonly called apoptosis (in Greek ‘falling off’) was not only awarded by the Nobel prize, but also determined the scientific agenda of a significant number of research teams for many decades to come. At the turn of the century, it became clear that, despite the phenomenon of programmed cell death, plants do not have caspases. However, it was discovered that plants have other enzymes with caspase-like activities. Most likely, they just like in animals execute cell death processes in plant cells. However, our study has showed that among plant cell death activators in wheat there are enzymes that do not have caspase-like activities. It confirms once more the existence of different mechanisms of programmed cell death across eukaryotic organisms”, concluded Prof. Zamyatnin.